Explore Rinnai tankless water heaters and see what makes them the best for your home? Find the expert review of the most popular gas-powered Rinnai water heaters for residential use. Discover the main advanced features and technology including the tankless, hybrid and condensing boilers. Rinnai water heaters manufacturer, with the long history of making the HVAC devices, became one of the most popular brands not only in Japan where it is coming from but worldwide, including North America. If you want to see a “proof” of the quality, incredible performance, and efficient operation, just read some of many positive comments found either on the Rinnai website or online stores, such as Amazon.com. All natural and propane gas tankless water heaters from Rinnai are built for domestic hot water production in residential and commercial applications. Water heaters can be used for delivering hot water to a single fixture as the point-of-use models, or for the multiple fixtures as the whole-house models. No matter are you building a new house or planning to remodel an existing, or maybe thinking to replace an old and inefficient tank-type heater and get more space, or want to get more hot water due to the expanding family, Rinnai tankless heaters and boilers could be your solution. Not only that Rinnai could provide delivery plenty of hot water to a shower or bathtub, but can also be used in multiple applications combined with the laundry, dishwasher, or any other residential application, even if it is highly demanding. Rinnai manufacturer offers two main groups of tankless heaters with many sizes to choose from and for any home type; condensing (SE and SE+ series) and non-condensing (HE and HE+ series), where the condensing type is what makes the difference. Rinnai water heaters with the tankless and condensing technology are ultra-efficient, Energy Star approved, “green”, deliver hot water almost instantly and in endless supply, have high water flow rate and include extended warranties – a great recipe to make the customers happy and help them save. Rinnai boiler is another option which can be used for combined space and water heating. There are Rinnai tankless water heaters for almost any home size and budget; from the smallest V53 with the maximum capacity of 120,000 BTU, the efficiency of 0.81 and price of around $600, to the largest RUR199, with the maximum gas input of 199,000 BTU, efficiency of 0.96 and cost of about $2000. For those looking for the top of the line water heating products to maximize the efficiency and savings, Rinnai condensing units and boilers are recommended. 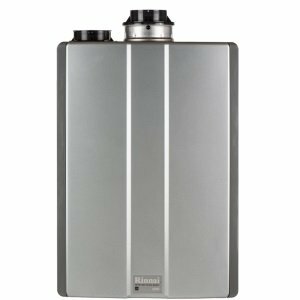 Rinnai tankless water heaters from V series are coming from the high efficiency but non-condensing group offering models with one heat exchanger and lowest capacity. Homeowners can choose models with the capacity from 5.3 GPM to 9.8 GPM, energy factors from 0.79 to 0.82, making them a good solution for small and mid-size homes, and delivering hot water from 1 to 4 fixtures. Models from V series are good choices for budget-oriented families, households with lower hot water demand and homeowners who prefer simplicity. They come with the 10-year warranty. Rinnai water heaters from the RL/RLX series are the next line of non-condensing models. While they have the same maximum efficiency as the V series, including the Wi-Fi capability, RL is easier to install, service and maintain as they consist of the isolation valves and could use the recirculation system due to built-in Circ-Logic technology, including the voice activation system for convenience. They have only two sizes: 7.5 and 9.8 GPM, and the warranty is more extended than V series – it is 12 years. RUCS and RUS models are coming from the advanced group (SE) of tankless and condensing water heaters that are, due to its super high efficiency of 0.85-0.90, Energy Star compliant. However, they won’t offer an option for faster hot water delivery as the RL models, voice activation, or the isolation valve for quicker service. While the V and RL series use concentric vents only, indoor models from RUCS series can use a twin-pipe system giving you more flexibility during installation, while the RUS are ventless. These models are available in two smaller sizes only; 6.5 and 7.5 GPM, delivering hot water to homes with 2 to 4 fixtures. Similar to the above RUCS/RUS models but with an addition of the Circ-Logic system and isolation valves, are the RUC and RU models – super efficient, Energy Star and with the ultra-low NOx gas emission. RUC models are designed for indoor use only in high demanding homes (from 2-6 fixtures, or from 8 to 9.8 GPM water flow). Rinnai RU series combines indoor and outdoor models with a variety of capacities, making this category one of the largest. Tankless heaters from both groups have efficiency up to 0.96. Rinnai RUR series comes with the top of the line tankless and condensing water heaters that utilize the most innovative technology available, including the Therma-Circ360 recirculation and Circ-Logic technology, Wi-Fi capability, smart home voice activation with Amazon Alexa integration, ultra-high efficiency of over 0.93 and high water flow of up to 11 GPM. All these together guarantee high savings and reduced waste, great convenience and comfort, reliable operation, flexible venting, extended warranty, and life expectancy. If you are looking for the best, a budget is not an issue and would like to have a tankless water heater with the state-of-the-art technology, buy Rinnai RUR199 with the 15-year warranty or RUR98 with a 12-year warranty. Rinnai water heaters come in multiple sizes and include many standard features and parts which are also replaceable and recyclable. So if something breaks, the great design allows an easy replacement. No more polluting the environment with the broken heaters, such as tank-type. All models are small and compact, providing endless and continuous hot water with accurate and stable temperatures. Some people will call them instantaneous as they heat water instantly (they do not deliver water instantly though). However, there are models, such as Rinnai RUR98 which comes with the recirculation system for faster hot water delivery. With the high efficient technology Rinnai hot water heaters deliver up to 40% savings in energy and can work with the low water flow, which is, for some models 0.4 GPM - enough for small jobs such as shaving. For those homeowners who require higher hot water delivery, EZ Connect system allows a combination of two units to work as one. Moreover, if hot water is needed instantaneous, a water heater from RUR series is an ideal solution due to its recirculation system. Just look for the ThermCirc360 technology, as found on the Rinnai RUR98 and RUR199. Hot water will be available as soon as you open the tap, and when using one of the two recirculation modes. RUR199 is the heater with the highest water flow of 11 GPM so as the efficiency (0.96). One of the greatest advantages of Rinnai hot water heaters is green technology, which provides better efficiency and less pollution. The gas burner is earth-friendly due to its ultra-low NOx gas emission. Indoor models are designed with the zero clearance and utilize sealed combustion. Clean and safe combustion, when combined with the unique venting system, is what allows flexible installation inside the home, as long as you follow the recommendation such as the professional installation and use of the original venting kits. Rinnai tankless water heaters are “smart” – they use a microprocessor that controls the operation of the unit and provides an accurate diagnostic if the problem occurs. The error code will then show up on the display of the built-in temperature controller, or provided remote controller helping the user in troubleshooting. The best models use the voice activation system, such as Amazon Alexa, Wi-Fi and Control-R mobile app with timers and schedules, remote control and diagnostics, providing, even more, convenience and comfort for the users. Indoor models require a venting system while the outdoor models don’t. Most of the indoor models vent the exhaust gases horizontally through the outside wall or vertically through the roof, using the dual or concentric vent system, with one of two wall penetration points. According to Rinnai, there are 14 possible vent configurations for some models. Vents on the condensing models are usually made of PVC and can run up to 65 feet in length. Water heaters equipped with the isolation valves ensure easier service when the time comes. If money is not an object, you have a large house and would like to enjoy the most advanced features one tankless water heater offers, choose Rinnai RUR98 or RUR199, from the RUR/Sensei SE+ series. What makes them different is the highest energy factor of up to 0.96, ThermCirc360 technology –recirculation system with or without a dedicated line and its ability to use the smart/mobile technology. All the features that are mentioned here could be found in any of the RUR models. According to the builder's magazine "Most Popular Products", Rinnai gas heaters are the most popular in the US, of all manufacturers. Rinnai manufacturer is a Japanese company, founded in the 1920s, that started distributing gas appliances in North America in 1974. On the global level, Rinnai has over 30 million installed water heaters around the world. Today Rinnai US has, not only the extensive network of licensed technicians but facilities where the research has been performing and training provided for new and existing representatives and service personnel.